Holders Coleraine last night paid the penalty in their Tennent’s Irish Cup semi-final against Crusaders at the Oval. Second half spot kicks from David Cushley and Jordan Owens booked Stephen Baxter’s team a place in the May 4 final against unfashionable Ballinamallard United. It has to be said, the game didn’t live up to its pre-match billing. It was a untidy affair littered with late tackles and misplaced passes. Owens missed the chance of shooting the Crues into the lead on 20 minutes when he was picked out by a delightful pass from Cushley, but his low drive was smothered by goalkeeper Chris Johns. The big turning point arrived on 55 minutes when referee Tim Marshall awarded the Belfast team a penalty after Paul Heatley was hauled down by a late challenge from Aaron Canning. Cushley confidently stepped up to fire past Chris Johns. 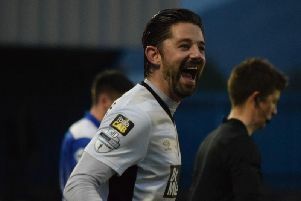 Referee Marshall then angered the Coleraine fans on 67 minutes by firstly awarding a penalty kick after Jamie Glackin had been brought down by Sean Ward, but then changed his decision after consulting linesman Richard Storey, awarding a free kick inches outside the box. The Crues wrapped it three minutes from time when Marshall again pointed to the spot after Gareth McConaghie clashed with Owens off the ball. This time Owens planted an unstoppable shot past Johns.